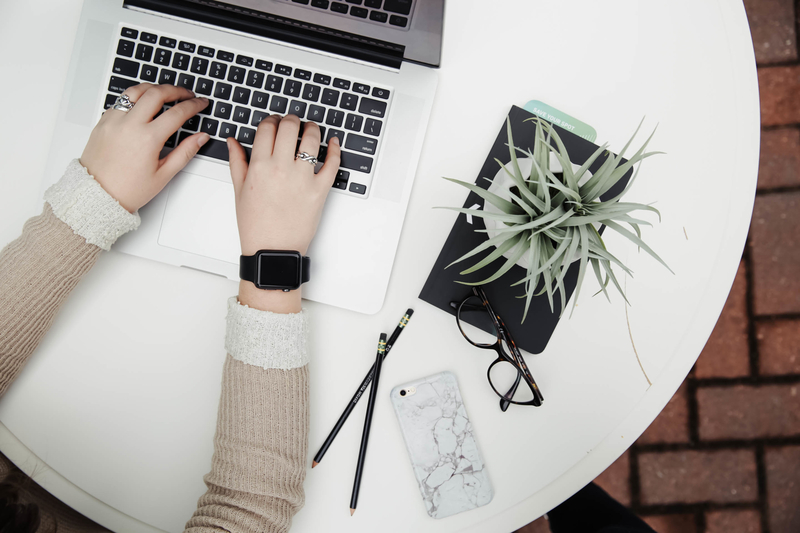 There are a handful of incredibly helpful Chrome Extensions for content writers and SEOs to streamline the keyword research process and uncover better insight into search volume and keyword competition. SEO Chrome Extensions can’t replace the more powerful keyword research tool like SEMRush that can give you better insights in bulk, but if you are an individual blogger who doesn’t want to pay for a premium service, these chrome extensions are all you need to discover what keywords you should focus on in your next article! Last year I started a niche blog around STEM Education (inspired by helping plan Computer Science Education Week fair in Boulder). When researching what topics I should write about, the following three Chrome Extensions were my favorites. 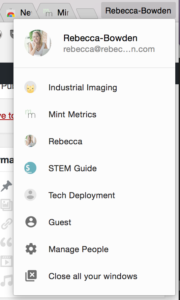 To ge t started, let’s discuss organizing your extensions. If you are as much as a chrome extension enthusiast as I am, you know that your browser can very quickly become cluttered with extra information. (Or maybe your newsfeed is blocked when you actually do want to be able to check Facebook!) This is why I use different Chrome profiles customized for my workflow. SEOquake is great for determining the competition for a keyword and if you have ticked the boxes for good on-page SEO. The first thing you will see after you have installed SEOquake is the keyword difficulty score below your search term. In my experience, this keyword difficulty metric should be taken with a grain of salt. 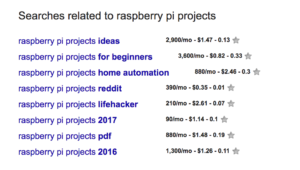 It is decent as a rough estimate if you simply want to compare how competitive “raspberry pi projects” is vs. “raspberry pi projects for beginners”. Beyond that, this keyword difficulty score is pretty worthless. The good information SEOquake offers is below! One of the features about it, is that I can easily switch it on and off in the side of the search engine results page. When you simply want to perform a search, all of the extra information really clutters the page. On the left hand side, you can easily change the location to see how search results change based off of where you are. This is helpful feature if you are writing articles that are going to be geared more toward a specific location, like a travel blog. But the real information to determine how difficult it would be to rank for that keyword is below the search engine result listing. There you get the Alexa Rank, the SEMrush Rank, number of links to the domain, number of links to that page, and the age of the website. A page with a high rank and a lot of inbound links to the page is going to be a lot more difficult to outrank. If you notice that it is a newer website without much authority, it might be a good keyword to focus on in your next article. If it looks like a keyword you may focus on, then you can dive even deeper once you click the page. From the page insights we can see keyword density, page SEO audit, SEMrush’s estimated traffic, and social engagement figures. This is still only the surface of SEOquake. It also connects with your Google Search Console to give you extra keyword difficulty metrics within your console. You can click through the tabs to get more information on internal and external links that will give you a good estimate of the link profile necessary to rank. Unfortunately there isn’t an exact formula that I can share with you to determine if you should write that article or not. It depends on the topic and how competitive that niche is. These tools can be most helpful when you are trying to determine between multiple article ideas you have, or if you are just launching a blog, evaluating how competitive that niche is. For example, I might use this process to help decide if my next post for my STEM blog discuss Raspberry Pi projects or invention kits for kids. Or I can find the long-tail keyword search that generates the most traffic with the least amount of competition. 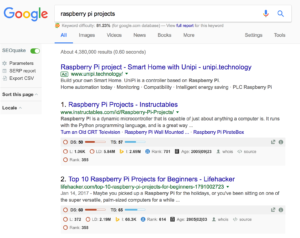 For example, “Raspberry Pi Projects for the Classroom” might be a better option than “Beginner Raspberry Pi Projects”. This is the lesser known chrome extension on this list, but my favorite. Perhaps because I really nerd out over search volume data. It’s fascinating to know what interests people most! Keywords Everywhere gives you the search data that is usually only provided with an Adwords account. I compared the search volume provided by Keywords Everywhere to the search volume provided by the Keyword Planner tool in my Adwords account. Nothing is going to be more accurate on search volume than Google itself. The difference is about 20k. That may seem like a lot, but Google only provides the search volume in an active Adwords account that meets a minimum threshold of ad spend. With a free Adwords account you see an estimated range of search volume in the Keyword Planner instead of this more exact number. If you are deciding to get search volume data from either a Google’s free Keyword Planner or the Keywords Everywhere extension, you will get similar search volume accuracy, but the Keyword Everywhere extension is far more convenient! This extension has a lot of features, similar to SEOquake, but its best feature is in giving search volume and competition for “Related Keywords”. The Related Keywords results on a Google search page has always been a popular way to find long-tail keyword ideas. The Open SEO stats takes it a step further so you know what related keywords have the most potential for search volume. It is really convenient to see the search volume right on the search engine result page and you can save the keywords to reference them later. MozBar is the most popular Chrome Extension for SEOs, so I have added it to the list. It has a great interface, but SEOquake has many of the same features. I would recommend test both and choosing the one you like most as your main SEO extension. If there is one reason that I have MozBar on my browser in addition to SEOquake, it is to compare the keyword difficulty score. There are even more SEO plugins out there, so test them and find the one that you like best. Ultimately, the information they provide though are similar. Chrome Extensions will give you insights for on-page SEO, backlinks, domain authority, and search volume and get you one step closer to having top ranking content.